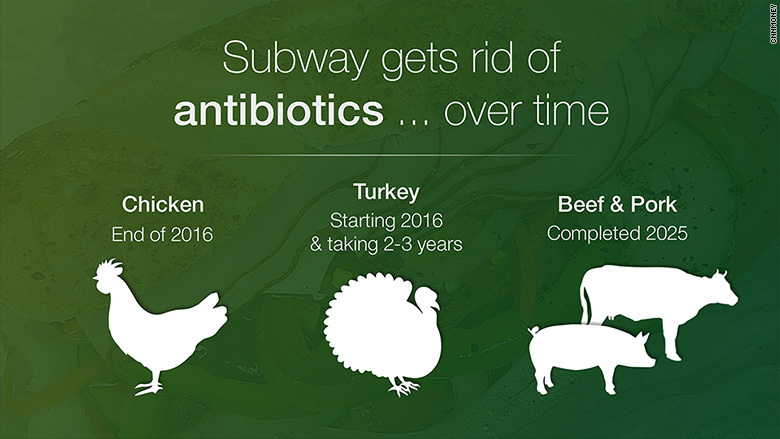 Subway has committed to making all of the meat it sells antibiotic-free -- but it's going to take a while. The company said Tuesday that it plans to serve only antibiotic-free meat by 2025. It first announced a plan in August to offer antibiotic-free chicken, although the chain didn't have a time frame. Now Subway says it will start selling chicken produced without antibiotics in March 2016, and expects to have it rolled out to all 27,000 stores by the end of next year. The chain will also start transitioning to antibiotic-free turkey in 2016, a process that will take two to three years. Finally, it will complete the switch with its beef and pork products by 2025. In June, Subway pledged to "remove all artificial colors, flavors and preservatives from its sandwiches, salads, soups and cookies in North America by the end of 2017." Switching its beef supply will take some time, Subway vice president Dennis Clabby said in a press release, because the number of U.S. cattle raised without antibiotics is "extremely limited," and cattle take a long time to raise. Company spokesperson Kristen McMahon added that Subway is working with suppliers to ensure there is no change in the "taste or price" of the food it sells. Subway's move is part of a larger trend among among restaurants and manufacturers to offer healthier fare. McDonald's (MCD), Breyers and Tyson (TSN) all announced efforts in 2015 to cut back on the antibiotics used in their food supplies. Additionally, Chipotle (CMG) has said it plans to stop using genetically-modified foods, while Dunkin Donuts (DNKN), Panera (PNRA), Kraft (KHC) and Nestle (NSRGF) have each announced plans to stop using some artificial ingredients.